Nevermore was one of the releases I was most excited for in the New Year. After the suspicious and kind of up-in-the-air ending of Blackout, I was dying to get back into the Crossbreed world. Our story mostly focuses on Christian and Raven, but we do get glimpses of the Keystone crew which I wanted to mention because the stuff going on with Shepherd and Hunter is so great to watch. So much growth and change for Shepherd. He made my heart swell a few times and I’m glad that he made the decision he did. Throughout the first part of Nevermore. I was frustrated with Christian for his lack of communication with Raven. Raven’s trusting of a cunning vamp truly had me freaking out. I wanted to warn her so bad before she got in too deep, but she just wouldn’t listen to my screamed attempts to contact her through my stereo! Most of the action boils down to Raven’s attempts to get her father out of the financial peril he is in. She must deal with shifters who are pretty powerful. Raven comes to learn how important her Keystone family truly is to her. I was so pumped throughout most of the story. I was dying inside for Raven and Christian, but Christian really shows a side to him that was unexpected. Raven’s dad was a hoot and just as stubborn as his daughter. Rush’s reaction to Christian was hilarious and I’m eager to see how their relationship develops. 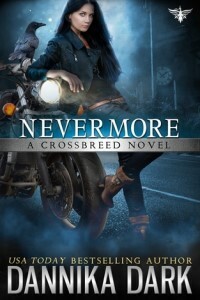 The Crossbreed series brings the drama of a romance in the works, with some pretty great action and just wonderful world building. Every character plays such an important part, and they all work together to make such a great team that goes beyond just professional relationships. I cannot imagine missing out on Nevermore in audio. Nicole Poole is the voice of this series and she truly brings it alive. This is one of the best author/narrator pairings I’ve heard yet. I can’t think of these books without thinking about the greatness of the audio. The wonderful writing and amazing narration bring the Crossbreed series to the next level and keep me coming back for more. Do I really have to wait another year for the next one? Someone tell me I’m going to get another installment this year!